Create Embellish Adore: its begining to look alot like.. Christmas?? its begining to look alot like.. Christmas?? Its November, the time I say every year I will have my Christmas shopping done before Tthanksgiving. I cannot deal with the rude shoppers, thank goodness I get most of mine done online. However for those 'odd and ends' that force me to stores, I need to get it completed by then. THANKFULLY, I am on the home stretch! Of course their is a birthday that is coming up that I must shop for... but STILL!!! 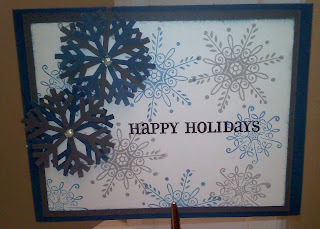 I can relax alittle and get some Christmas cards done. I wish you could see the shiny glitter in this picture however, after 4 shots and it wasn't showing up... you will have to use your imagination to see it! I have some cleaning up to do, and found pieces that I was able to use here. I like the Not so Navy with the silver and grey. Its the sentiment I had to work in that I am not 'crazy about'. Thanks for looking! Have a great day!! !